For example, if you're using the Metro UI (i.e. 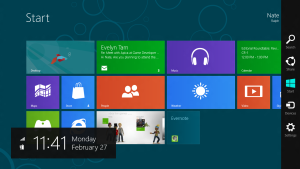 the new Start screen with all the tiles), you've undoubtedly installed some apps. That's half the fun, right? Okay, but what happens when you want to remove an app? It's not immediately obvious. If you pull up the Charms Bar and tap Settings, no help there. If you tap the Change PC settings link, you'll find no uninstaller there either. Well, there's always good old Control Panel, right? Wrong: When you get there, you'll see that apps aren't listed. Guess they're not "programs" in the traditional sense. As it turns out, if you're operating Windows 8 with a mouse, it's a snap to uninstall an app: Just mouse over its tile, right-click, and then choose Uninstall from the options toolbar that appears at the bottom of the screen. Of course, if you're using a touchscreen, there's no right-click option. But my Hassle-Free PC intuition told me that tapping and holding a tile would bring up that same toolbar. Wrong again. That process requires a little dance: tap and hold a tile, drag it down just slightly, then release it. You'll see a checkmark in the corner of the tile and the toolbar down below. Now you can tap Uninstall to remove the app. Now that I know this little trick, it seems easy enough, but I don't understand why Microsoft added that little down-drag step. With every other touch-based user interface, you just tap and hold. Indeed, if you've ever tried to rearrange your tiles by tapping and dragging, you know that it doesn't work the "normal" way: you have to do that little down-drag before you can reposition a tile. It's not hard, it's just unintuitive. Merely my $.02, of course. Feel free to debate my intelligence below.